DataSunrise Data Discovery for Google Cloud SQL is the solution that guarantees your sensitive data privacy. Data Discovery is a mechanism built into the DataSunrise Database Security Suite to find sensitive data in Google Google SQL databases. This is the tool to make first step to be compliant with national and international private and sensitive data protection regulations. 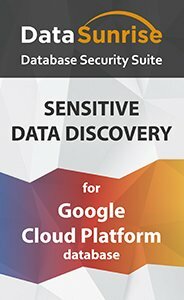 The best way to understand what sensitive information any Google Cloud SQL database contains is to run the DataSunrise Data Discovery tool. It will give you full understanding what sensitive data in your databases needs protection. This is a reliable feature that can be used whenever you feel that appropriate: during development, testing and any other database-related processes. Also you can set Periodic Data Discovery, in this case sensitive data will be searched for at the preset intervals of time, that is periodically. What you see above is very important personal information which definitely needs proper treatment and protection. Maybe you don't even know that you have this information in you database. Totally there are about 25 types of information that can be located and identified in any Google Cloud SQL database. Use DataSunrise Data Discovery tool to make sure that no bit of sensitive personal information is left unattended. After identifying sensitive information you can rely on DataSunrise to protect it. For this you just need to use Security, Data Audit and Masking tools from DataSunrise for Google Cloud SQL.